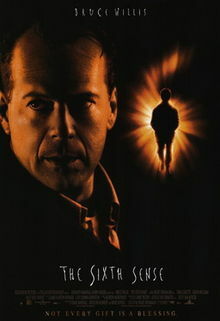 All I knew going into The Sixth Sense was that it featured Bruce Willis and there was a twist at the end. That was about it. Thus, it was an interesting opening to have our main character already be shot within the first few minutes. But it’s not much of a spoiler per se because we quickly flash-forward to a year later. That first case came back to haunt him in the form of a very distraught patient, with a major grudge, however, Dr. Malcolm Crowe has seemingly gotten past it and continued with his life. It doesn’t mean that his marriage is not still difficult and his work still taxing, but he gets by. Finally, he gets a case that might help him resolve his previous failures, at least that’s how he sees it. Of course, the intelligent, but aloof boy Cole Seer (Haley Joel Osment) sees the world in a whole different way. He literally sees dead people, but let’s take a step back for a moment. He has trouble connecting with his loving but nevertheless troubled mother (Toni Colette) and Dr. Crowe seems like his only friend. None of the kids at school like him, because they think he’s a creep. What Crowe does is help him work through everything that it is unique about Cole and also help him see that there may be some purpose behind these ghosts that he can see. They want him to do things for him so maybe this is Cole’s chance to help them. And so he begins the process and despite it being terrifying and disconcerting at times, he is able to lay to rest these specters. Finally giving them peace and in the wake of a traffic accident that results in a death, Cole finally opens up to his mother. She has trouble believing him at first, but she never discounts her son, which leads to a tearful scene between mother and son. M. Night Shyamalan is obviously well-known for his great interest in supernatural stories with twist and turns, but to his credit, he firmly plants his films in a reality, like Philadelphia, that we can grasp onto. That’s our base and he can go from there with psychological thrills and even a touch of horror. However, his film actually has characters that are far from throwaway, even if we just look at Malcolm, Cole, and his mother. They are individuals that we can grow to care for over the course of the movie even with the supernatural plot devices and of course, the final surprise ending. Honestly, I had an unfair advantage knowing that something was coming, so I caught onto some of the peculiarities leading to the final disclosure, but I was still relatively surprised when it came. Despite the rather contrived plot and purposefully cryptic opening, followed by a long wait, the final payoff of The Sixth Sense is certainly worth it. This entry was posted in 1990s, Drama, Horror, Thriller and tagged Bruce WIllis, Review by 4StarFilmFan. Bookmark the permalink.